Veena Choudhury's khaki' green and white school uniform stands out among the bright saris' arm bangles and nose and ear jewellery of the older female relatives around her. So do her views on what she wants to do in life' even though she's the daughter of an illiterate farmer from a poor rural district. Looking you straight in the eye' 15-year-old Veena states plainly' "I intend to become an engineer." Never mind that her mother and grandmother were married with children by the time they were her age. Only five per cent of the girls in this' the central regions of Rajasthan' complete secondary school' and to take up engineering as a profession would be beyond their wildest dreams. Yet' Veena expects to be one some day. Sowhat is it that makes her aspirations ring true' even as most other girls in her remote village look merely to follow in their mothers' footsteps? What distinguishes her from her peers and even her mother' who still works 10-hour days in the fields and covers her face in the presence of strangers? The picture becomes clear as you follow Veena early in the morning as she rides her bike from her village across a dry riverbed to a friend's house. The bright yellow bus she catches has 'Fabindia School' written on the sides. The bus collects Veena and her brother Vinod' the start of their journey to a better life some day' away from the poverty and narrow prejudices. Away from the future the past had predicted for them. The Fabindia School opened in the town of Bali' in Pali district' 10 years ago. It's a non-profit private school established by William Bissell' a half-Indian' half-American Delhi-based entrepreneur who heads the Fabindia Group' a leader in marketing handloom home furnishings and clothing. Bissell's idea was to create a prototype school' empowering rural youth of diverse backgrounds from the poor districts to "shape their own lives and transform the state of Rajasthan". From its inception' the Fabindia School has been committed to educational opportunity for girls in a region where most parents' even if they could afford an English medium school' would send only their sons. To attract girls' the school even subsidises their tuition. At the school' Veena is first in her class' excels in science and mathematics and has a lead role in this winter's school play. She carries herself with dignity and self-confidence' holding her own among male schoolmates whose sense of entitlement comes more from a feeling of caste superiority. In addition to becoming fluent in English' Veena is also getting a strong grounding in other subjects. The school strongly supports equality for girls' and they hold many leadership positions here. It also stresses environmental education' exposing students to the issues of the larger world through workshops conducted by expert visitors. There is normally a sad irony to the story of rural development. When children like Veena move up in the world' be it through education or their own burning ambition' they usually migrate to Bombay or Delhi or emigrate' abandoning both family and their home districts. The Fabindia School teaches students to take pride in their local heritage' instilling a sense of responsibility on the future of rural Rajasthan. It encourages students like Veena to consider working nearer to their homes' hoping they stay connected to their birthplace. With the 250-student "core school" in Bali now well established' the plan is to open more Fabindia Schools elsewhere in Rajasthan.In June' the first satellite school will open in nearby Ghanerao. A prosperous business family based in Bombay'but originally from Pali'is contributing the capital to build the Ghanerao school' modelled on the virtue of reinvesting in one's rural origins. 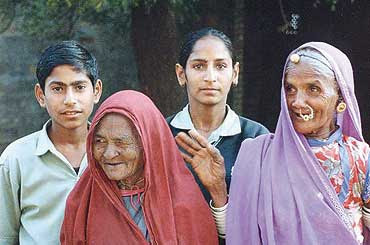 Hopefully' some day' the hundreds of Veenas and Vinods will also play a part in the transformation of rural Rajasthan. Outlook's weekly profile of people who work under wraps, beyond the laudatory limelight.